Why Do Land Rights Matter to Communities and Companies? FILE - Indigenous protesters from various ethnic groups carry fake coffins representing Indians killed over the demarcation of land, as they demand the demarcation of indigenous lands, outside the National Congress in Brasilia, Brazil, April 25, 2017. Experts met in Stockholm this week to assess progress on securing land rights for indigenous people and local communities and how businesses connect to them. More than half of land rights conflicts in the developing world are not resolved, pitting companies, governments and businesses against indigenous communities, according to research published at the conference. Here are the views of 10 experts interviewed by Reuters during the two-day conference on the role of local communities, technology and business in ensuring secure land rights. "Tenure rights, in a country like Mali that has just experienced a crisis, are very important for ... development because more than 60 percent of the population is rural and lives from the land and ... more than 50 percent of them are women. So the issue of land rights, especially women's land rights, is very important. The issue of land rights is also strongly linked to the question of climate change. The more people have rights over their lands, the better they protect them, the better they manage them to fight against climate change." 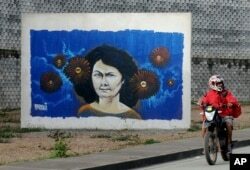 FILE - A motorcyclist rides past a mural of slain environmentalist and indigenous leader Berta Caceres in Tegucigalpa, Honduras. "For indigenous people, having secure land rights means securing their lives now and for future generations. It is also very important for protecting our climate, it contributes to maintaining forests and in general it contributes to the development of indigenous people. ... If there is no legal recognition, our forests are more likely to disappear. Unfortunately, the reality is still that the dollars that are invested in indigenous lands still count more than the well-being of our communities." "We have two existential threats to the planet. The first is climate change, and the second is inequality. By working on land rights, secure tenure for indigenous people and local communities, we can achieve first a reduction of inequality in the world by providing these people with the assets and resources that improve their economic well-being. At the same time, as the research shows that by giving land to indigenous people, they protect their forest and reduce deforestation, which in turn contributes to a better climate." "Land rights matter in different ways, in the fight against climate change, but also ... in eradicating poverty and in reaching the [United Nations'] Sustainable Development Goals. It matters because knowing who has the right to use a forest, the land, et cetera in different ways ... gives indigenous people and local communities possibilities to support themselves, to build their own capacity ... their own present but also their own future. Therefore, land rights are important to make a clear distinction of who has the responsibility of actually combating and stopping climate change and the possibility of eradicating poverty." FILE - Security officials block Pataxo indigenous men from entering the Planalto presidential palace in Brasilia, Brazil, Nov. 22, 2016. Brazil's various indigenous groups were demanding that the government recognize their ancestral lands. "Land rights are a very important issue. It's really critical to secure that businesses are responsible. ... Securing land rights is critical for addressing the biggest challenges we are facing today. It's deforestation, it's climate change, it's gender equality, it's rights of people. But it's also about the livelihoods and the rights of those people living in rural areas who own the resources." "Land rights are very crucial for the continuing survival, dignity and well-being of indigenous peoples. If their lands are taken away from them, it really means their identities, their cultures are also going to be destroyed. So it's not a simple matter of land as an asset or a means of production. It's really land that is the source of life, of identity, culture. Not recognizing those land rights basically means ethnocide. In some cases, it's genocide and will lead to the disappearance of the people." "Technology is always a tool that can be used to scale the work of organizations working on land rights issues. Drones can capture aerial data in a much faster, more efficient and higher quality way to provide a basis for land rights organizations to show the current state of land. In a very accurate way, [drones can] demarcate people's own property and lands of communities and provide a specific proof of what the current state of land looks like that can then be used to provide people with rights to the land on which they live." 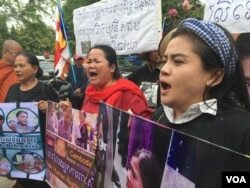 FILE - Bov Sophear and Song Sreyleap, land rights activists in Boeung Kak community, shouted for justice before the Supreme Court, Feb. 27, 2017. "As an agribusiness, land and people are very much at the foundations of our business. ... We can't operate in an unhealthy environment. We need to investigate land rights on our own estates and in our supply chain and need to identify and understand the challenges to find sustainable solutions. We're also looking at assisting farmers to address their own land rights challenges to improve the transparency and sustainability of our supply chain and enable them to take better control of their livelihoods, make better choices on how they use their land and feel more secure in how they engage with us or with anybody else they choose to engage with." "Humans are the stewards of the earth, of the land and the natural resources. To be able to be good stewards, we have to recognize [indigenous people's] land rights. This is the purpose of our work: We assist them and help them in the process of recognizing these rights, so they can do the work they do so well. Stewardship is part and parcel of their lifestyle. ... It is their contribution to the earth. Ours is the recognition and assistance to help them in the recognition of [their] land rights." "Forests are vital for communities. It's where they live, where they find their food, their culture, their education and it is in these forests that they find everything that is indispensable for their lives. If we chase them from their traditional forests, they become beggars, they become people without roots and they lose their culture and their way of life. And so they are condemned to die."